Montana State University Billings is considering how best to spend a one-time injection of 760-thousand dollars. MSUB Chancellor Mark Nook announced the Billings campus will receive a one-time windfall of $760,000. He says the money will be used to recruit and retain students. 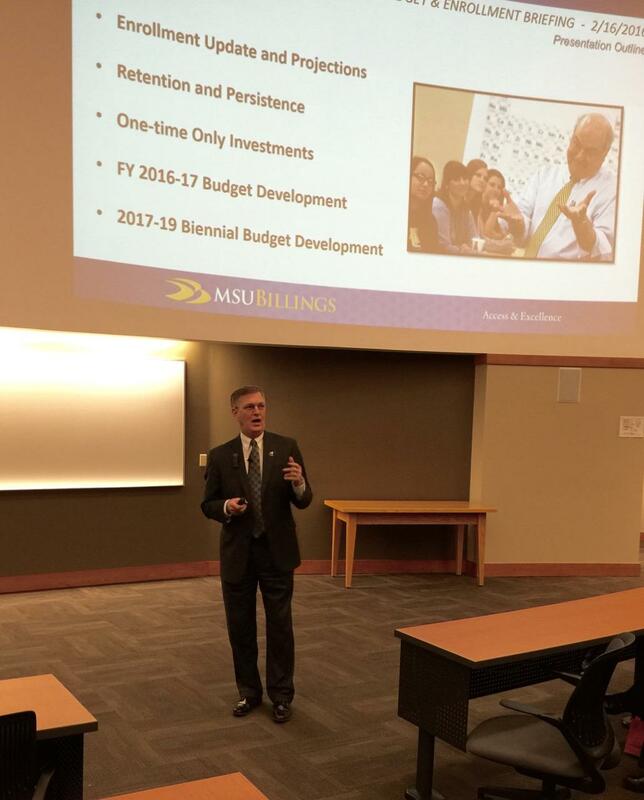 Chancellor Mark Nook told a gathering of faculty and staff there will not be a spending spree. Rather, he says this money will be for recruiting and retaining students to MSUB and City College. “Right now we’ve got to stay focused on how do we recruit students for the fall,” Nook says. Last Fall, MSUB saw a drop in enrollment for the fourth straight year. Because state funding depends full-time equivalent students, the campus took a financial hit. Nook says this Spring’s enrollment numbers are better than last fall, they still fell short of earlier budget projections. The one-time windfall was awarded because the Billings campus met goals set under the Montana University System’s Performance Funding initiative. It’s based on a combination of several factors, most notably keeping students from dropping out and getting students graduating with a certificate or degree. Nook says when MSUB is compared to peer institutions, it lags in retention efforts. It’s currently averages around 56%. He wants to move that to 65% in 5 years. So among the ideas being considered with this one-time-only windfall, additional student scholarships and a system to detect when a student is struggling and to provide help to prevent a drop out. “And then work real hard on what are the new programs that will attract a different market of students,” says Nook. He’s looking for community input on what those might be. Nook says he’s already working to expand the 2-year Associate’s Degree in Nursing to a 4-year Bachelor’s Degree. But as for what new programs MSUB and City College might pursue, he wasn’t yet ready to make that public. The money must be spent by the end of the current fiscal year. The budget committees on campus are to come up with a recommendation by the end of April. The final decision will be made by Nook.